Many Zambian artist or artists resident in Zambia still have to discover what the Internet can do for them. This website shows how the Internet makes your art accessible for viewers world wide - by a few simple clicks. The same medium allows you to enter a world of near infinite information about art or anything else you are interested in. It allows you to almost directly communicate with parties interested in your work, through e-mail, by chat or webcam. And, apart from information, communication and promotion the Internet facilitates doing business. You can buy and sell art via The Net. The Internet therefore enables you to function better as an artist and helps you to make a living out of art. ANDREW MULENGA is an art reporter and journalist publishing in The Post, Zambia's leading tabloid. He has a Blog titled: Andrew Mulenga's Hole in The Wall. You can subscribe to the Blog by e-mail - if you have e-mail. His posts are than automatically sent to you as e-mails. If you don't have e-mail you can go to the Blog itself by typing its Internet addres or URL into the address window of your browser. Go to: http://andrewmulenga.blogspot.com - it is worth it. (GIJS)BERT WITKAMP is another blogger and www publisher. 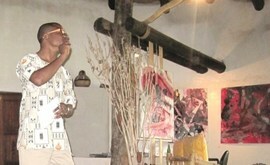 His Blog is titled Art in Zambia Blog (formerly ZamArt Blog). This blog was initially set up to generate interest for a fully developend website that is to function as a virtual Modern Art Museum, a Gallery with exhibitions having art for sale, a Notice Board, and a forum for communication. Lack of access to the software expertise has obstructed realisation so far. Instead this less ambitions website has been constructed. ZamArt Blog is at htttp://artblog.zamart.org You can also subscribe to it if you have an e-mail address and preferably a laptop or pc as well. He also does this web site. You'll find some of his writing at Texts-on-Line, including on art and the Lives and Times of Mr Sir Orange, the celebrity cat who is Minister of Fisheries and Art of Orange County. The ART GALLERY of the Choma Museum and Crafts Centre Trust Ltd. since January 2013 has a basic website. It is administered and managed by Bert Witkamp and is therefore another Zamfactor Ltd. service. Go to: http://chomamuseumartgallery.weebly.com. The name of the website is Choma Museum Art Gallery. It provides information about exhibitions, exhibiting artists and forthcoming events. Its e-mail link enables visitors to the site to make access information they are in need of and inquire about art for sale. Work on this site has discontinued since December 2013 when the CMCC changed its management. Clare is also involved in the Visual Arts Council and secretary of its Livingstone branch. http://www.lechwetrust.org/ prividing information about the trust, the collection and its activities. Andrew officially opening the exhibition "Processes" at Shazula Gallery on 9 December 2012. 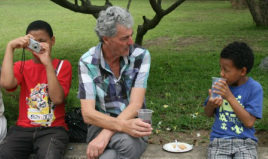 Bert and youngest children taking a break at the opening of the 2012 Arts & Crafts exhibition at the Choma Museum on 1 December. 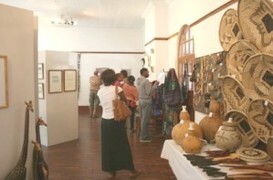 The 2012 X-mass Arts & Crafts exhibition at the Choma Museum. I quote: "The purpose of this website is to showcase the extent, quality and variety of this talent (i.e. of Zambian artists) and to bring together as many Zambian visual artists as possible on one website, while linking to their own personal websites." The site is well designed and quite a bit of work has been put into it. To date artists represented are largely from the Livingstone area. The service is provided freely and hopefully many Zambian artists shall plug into it.